Africa's musical culture, based on a very rich rhythmic structure, is dominated by percussion instruments, particularly drums and balafons (gourd-resonated frame xylophones). 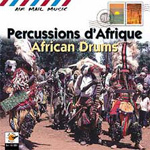 This compact disc presents a real festival of African percussion instruments, recorded in the field in Cameroon and Senegal. Stránka vygenerována 22.4.2019 v 23:03:17 za 0.174 sekund.